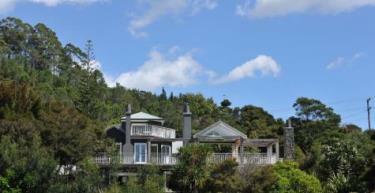 The Boatshed Seaside Boutique Hotel Reservations. Call 020 7962 9933. Capturing the essence of Waiheke Island, the Boatshed is a charming boutique hotel where beach chic meets luxury living on the white sandy shores of Oneroa. With pretty blue clapboard exteriors and fresh, white washed rooms inside, it’s the perfect spot for laid-back stay on Waiheke. A range of spa treatments can be enjoyed in the privacy of your room at The Boatshed, including various types of massage, reiki, body scrubs, wraps and facials. With just 5 guest suites and 2 bungalows, a stay here feels more like a visit to an old friend than a stint in a hotel. Each room emits the atmosphere of a stylish beach hut, with direct beach access and shuttered doors. Close up and night and you’re in a luxurious home from home with an open fire, sumptuous beds, a TV, DVD player, CD player, Bose Ipod Dock and magazine, book and CD selections to keep you entertained. Alternatively, choose the lighthouse for a romantic escape, where bleached wooden steps lead from the sand up to a three storey home with glass doors and exquisite views. All room types come with free WiFi, a mini bar replenished daily with complimentary treats and air conditioning. You probably won’t want to leave the Boatshed, with its outdoor seating area perfect for reading a book and its picturesque beach ideal for a swim or sunbathe. But venture out into Waiheke Island and you’ll find vineyardswhere delicious New Zealand tipples are made, mile after mile of naturally stunning beaches and marinas from where yacht cruises depart daily. Using vegetables grown in the garden, succulent local meats and freshly caught fish, the Boatshed serves delicious meals in its restaurant where guests can choose to dine al fresco or in the cosy interior. Meals are washed down with local Waiheke wines, too.